PLEASE WELCOME MY VERY GOOD FRIEND, WONDERFUL WRITER, GREAT ENCOURAGER, AND ALL AROUND FUNNY LADY, JULIE LESSMAN. Love you, Julie! Thanks for being our guest this month! Julie is giving away 'your choice' copy of any of her books. So be sure to say hello and chat with us. Don't forget to leave your email so we can get in touch with you should you win. Uh, wrong. And, yes, I was that green of a writer, one who actually didn’t consider the historical aspect of my story as important as the emotional tug-of-war between the hero and heroine. I mean, come on now, everybody knows the most important thing is WHAT happens in the story, not WHEN it happens, right? Wrong again, a lesson I learned the hard way, which is my usual mode of study, apparently. I can still see the twelve two-sided pages of feedback my critique partner gave me on A Passion Most Pure, my debut novel in The Daughters of Boston series. Simple little things that may have been nit-picky to me, but were deadly to the historical accuracy and feel of my story. And the WORST offense of them all, a blunder that almost derailed my plot completely and got past me, my critique partners, and my editor. A huge mistake caught, ironically, by my editor’s husband who happened to be—what are the odds?—an Irish historian! He innocently pointed out to his wife that the O’Connors traveling on a ship to Ireland during World War I would not have been feasible as passenger ships at that time were commandeered for war. Not to mention the annoying fact that German U-boat warfare made it too dangerous for ship travel. Sigh. So, how does somebody like me who despises research tackle the job of ensuring that the setting, speech, hairstyles, clothing, mannerisms, appliances, music, movies, etc. are good enough to transport your readers to the era along with your characters? 2.) HISTORICAL TIMELINE: Fun website!! http://timelines.ws/. 3.) ONLINE ETYMOLOGY DICTIONARY: Without question, THIS is one of the sites I use more than other! As a historical writer, I have to make absolute sure that the words and slang my characters use typify or even qualify for the era for which I am writing. To this end, I would be absolutely lost without the Online Etymology Dictionary. 4.) ANSWERS.COM: I always research slang sayings and phrases as well through favorite Web sites such as: http://www.answers.com/. 5.) Finally, as I write, I will research various things like automobiles, telephones, appliances, etc. to make sure they were available then and how they worked. One Web site I’ve used for appliances is http://www.oldandinteresting.com/, and another good general Web site that touches on a lot of historical items is Charlotte Dillon’s “Research Links for Writers” at http://www.charlottedillon.com/ResearchLinks.html. Ironically, my critique partner gave me a progress report on the first book of the next series I wrote, and you guessed it—she nailed me again. Sigh. “Key,” “lever”—who really cares? Well, when you’re talking historicals, the reader does, apparently … and now, so do I! 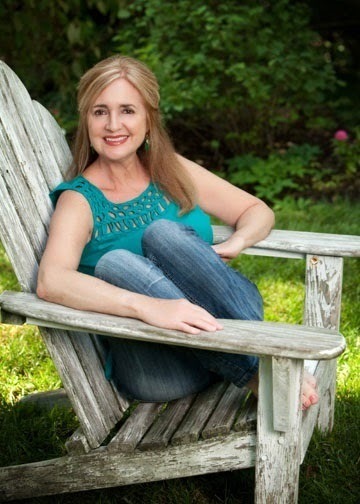 Award-winning author of “The Daughters of Boston” and “Winds of Change” series, Julie Lessman was American Christian Fiction Writers 2009 Debut Author of the Year and voted #1 Romance Author of the year in Family Fiction magazine’s 2012 and 2011 Readers Choice Awards. She has also garnered 15 RWA awards and made Booklist’s 2010 Top 10 Inspirational Fiction. Her ebook A Light in the Window is an International Digital Awards winner, a 2013 Readers' Crown Award winner, and a 2013 Book Buyers Best Finalist. You can contact Julie and read excerpts from her books at www.julielessman.com. Good morning Julie! I came over from Seekerville to read your post today. Thank you for all the great links for making sure your historical novels are accurate. I would love to be entered to win one of your books. Hello Cindy! Thanks for coming by 'The Society' to say good morning to Julie. So glad to have you stop in. Good luck! Hey, Cindy, good morning to you, too, my friend, and THANK YOU for popping over from Seekerville!! LOL, don't thank me for making sure my books are historically accurate -- thank my editors!! They ROCK!! :) GOOD LUCK and I hope I get to send you a signed book, girl! Very Cool, Julie! I've read several of his books. Our church went through The Purpose Driven Church. Very good! Julie! So glad to have you here today. I'm off to church and our pastor appreciation dinner shortly, but can't wait to come back and chat! Hey, Deb, I just came from church, and would you believe our speaker was Rick Warren??? Via videotape, of course, but awesome all the same!! You won't be disappointed if you read her books!!! Would love to win Love at Any Cost. Love her books! Oh I know, Melissa! Aren't Julie's books wonderful? She does such a great job of characterization you can't help but fall in love with her characters! Aw, thanks, MELISSA, for your kind words! And goodness, girl, we need to get Love at Any Cost in your hot little hands because book 2, Dare to Love Again will be out in TWO MONTHS!!! :) So here's to a win!! Loved this post! Thanks for the useful links. I would love to win one of your books! Which was your most favorite scene to write and why? Thanks for the chance to win! Hey Sally! I know your question is for Julie but I have to tell you I have a scene in one of her books that is a simple scene but it sticks out so much I remember it as if I was there. It was in A Passion Most Pure when Faith hides in the bushes off the porch and listens in on a conversation between Charity and Collin. Loved that scene! Oh, WOW, SALLY ... you're really gonna make me choose??? Sigh. Well, then I will tell you my favorite romantic scene, family scene, and spiritual scene, okay? Romantically, for me, nothing beats Katie and Luke's first kiss in A Hope Undaunted. Of course Luke and Mitch are my FAVES as far as heroes I've written, but there's just something so compelling about that scene in the office when Luke realizes hard, callous Katie O'Connor (the little girl he always had a crush on) is actually vulnerable AND attracted to him. And NOTHING is more attractive to Luke McGee than vulnerability because he has such a heart for the downtrodden and underdog. The scene goes through a gamut of emotions, from fear to attraction, to vulnerability, to shock, to anger, to retaliation, and finally to regret and humility. Spiritually, for me, there are so many scenes that tear me up, especially the one from A Love Surrendered when Annie reads the birthday letter from her father who died of cancer three months prior. Oh, and the scene at the end of that book where Steven FINALLY comes to the Lord when he looks up at the sky with tears in his eyes and says, "I don't understand -- why do you even care?" Because you are mine, the thought came, and Steven bowed his head and wept. Because for the first time in his life, he finally understood. But I think my favorite spiritual scene as far as a lesson I learned was at the end of A Passion Denied when Brady is desolate, believing he has committed the unpardonable sin, and Father Mac opens his eyes. Wow ... I still can't believe I wrote that because it SO speaks to me and, I hope, everyone who reads it. My favorite family scene has to be from Katie and Luke's story, A Hope Undaunted, when I literally have something like 10 POV shifts during ONE SCENE while the family are waiting in a hospital waiting room, worried sick about their father. The O'Connors are SUCH a close-knit family and have SO many substories going on that it was fun to connect them all together with one traumatic scene. WHICH is one of the reasons A Hope Undaunted is my favorite of all the books I've written -- because it represents the best microcosm of the O'Connors in all of my books. Good Morning! Julie has a talent I see in very few writers. Her books always draw me in. So glad to see you have read them too and enjoy them! Good luck! Julie, I love reading Historical Christian fiction, and when I find one of those "keys" it doesn't wreck the whole story, but it does diminish its authenticity. So thank you for taking the time to research accuracy. Also thanks for posting those links, I don't write, but sometimes I find times I wish I knew the history of the word itself. Keep writing your wonderful books! God bless! Oh, AMY, I know JUST what you mean!! If I had a dollar every time I read the line (or a variation of) "wrap his/her brain around it" in a historical, I want to scream. Seriously -- you watch -- you will see it TONS, which is SO wrong because that is SUCH modern slang. But then I suppose I can be accused of sounding too modern in my dialogue, I know, because I am a casual, down-to-earth speaker, so I write dialogue that way despite the fact that language was more formal back then. My reasoning is that people are people and talk down-to-earth in personal situations, so as long as you use words they used back then, you can get away with it. Thanks, Amy, for coming by and GOOD LUCK!! Thanks for coming by Amy. There are certain things that take me out of a story. It doesn't mean I can't get back in, but it is jarring. Good luck in the drawing! Good Morning, Julie! I loved your post. I am afraid that I would certainly miss an"important fact" if I was a writer. I love the "keep on, keeping on" of writers. Strength and endurance! I love reading and I love good books. Thank you for the opportunity to be a winner! So funny! Though I write mostly contemporary, I have done 2 historicals and I KNOW what you mean! Had to figure out if people had telephones in the house, working toilets, cars, etc. I've made several blunders like that too. Thanks for the links. They will come in handy if I ever write another historical! 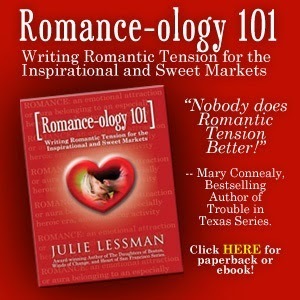 I'd love to win a copy of your Romance-ology 101! P.S. Want to congratulate you again on your new little grandson, Micah! How exciting! Thanks, SUE, and SUPER CONGRATS to you, too, you 2-book-deal debut author, you ... or is it 3-book deal by now??? Oh, yeah. I wanted to say that I remember all too well that lever on the typewriter you had to slam to the side to get to the next line. I learned to type in Grade 9 on one of those old fashioned typewriters! Fun memory! LOL! I had it in 9th grade too! And I got in trouble for pulling my paper out really fast and making that zzzzzzzzzzzzz sound. Had to stand up for the rest of class. Now that makes typing interesting. Julie, Thanks for sharing the tips on making the books, historically accurate. I am so glad I discovered your books. Keep up the good work. Good Luck, Wilani. Thanks so much for coming by and saying hello. Oh, LANI, me too, my friend!!! LOVE having you as a reader friend, girl, so THANK YOU for your support!! Loved this post - I don't write, but copied your list, just in case - I ever need to do some research! I used to hate history in school, but love learning little bits of history via this blog! I sure would hate researching EVERY little word, as a writer - though! My question is: how do writers, actually, find time to write, with all the researching, editing, promoting, planning, etc., etc., etc. - to say nothing of families & homes to care for, other occupations, & leisure time (yeah I know - what's that, right? LOL). Let me just say that this is one of the many reasons I love, & appreciate, all Christian fiction authors, & want to extend a HUGE thanks to all! Thanks for the opportunity to win another book from my favorite author! Hugs! Hey Bonnie. I can say some days are better than others for getting things done. Then there are times when emergencies or a family crisis happens and you have to burn the candle at both ends! LOL, BONNIE, you said, "My question is: how do writers, actually, find time to write, with all the researching, editing, promoting, planning, etc., etc., etc. - to say nothing of families & homes to care for, other occupations, & leisure time (yeah I know - what's that, right? LOL)." DEB!!!! SOOOOO fun to be here, my friend, not only because I LOVE you, but because I haven't had a blog giveaway for a long while now, so I'm PUMPED to chat with your commenters!! Love spending some time chatting, Julie. Sunday's are always a packed day. And for us today was pastor appreciation day along with a picnic. So I'm late coming in on these comments. But so glad you are here for the day. Hello Julie, here we are meeting once again... I would say that a person that loved Gone With the Wind as well as you did and do has to have some historical writing in her. I want to read that special story that is in you and not written yet. I have read many and loved the ones I have read so far, but I think you have a special one that will come out one day too. Hey Paula! Thanks for coming by. Julie is such a fun person and you got her right, she is such a caring, loving lady. So glad God put her in my life! As a reader I so appreciate all the research that goes into making novels as historically accurate as possible. It makes me feel like the setting is more authentic and realistic. Thanks for the free download of your book- I'm looking forward to reading it! OH MY GOODNESS, Heidi. If you haven't read A Passion Most Pure you are in for such a treat! Good luck! Thanks for coming by, Shirley. Good luck! Oh, SHIRLEY, trust me -- not as much as I would "LOVE" you to win one, so here's hoping we pull your name out of the hat!! Hi Julie! I certainly appreciate all the hard work and diligence that the writing process requires. Thank you for your authenticity! I loved participating in Carrie Turansky's recent facebook chat and was delighted to hear your sweet voice! I was fascinated to learn that you wrote 150 single spaced pages at age 12 that later became your debut novel. What a wonderful story!!! Thank you for visiting today and for the opportunity to win one of your novels! Hello Britney. Thanks for coming buy and chatting. Julie was amazing at even 12 years old! Hey, BRIT ... yeah, Carrie's FB pty chat was fun, wasn't it?? Thanks for attending! Hey Rachelle! Thanks for coming by. Good luck. Hey Joanne. Thanks for hopping over here! So glad you came. Good luck in the drawing! LOL, Joanne ... hop away, my friend!! Would LOVE to send you Charity's story because it's my fave of the DOB series. I mean, come on -- Mitch??? HUBBA, HUBBA!!! I have loved your books from the start! "A Passion Most Pure" is the best Christian Romance I have ever read. Unfortunately, I finished it all too quick and had to anxiously await each new copy to be published before I could continue the tremendous adventure you had set up for me! I loved this article, and hope I win the prize! I have all of the hardcopies of your novels, but I would absolutely love the "A Light in the Window" e-book because I would LOVE to hear the story on Marceline and Patrick...or--if only you are doing this--the new book "Dare to Love Again" when it comes out. I can't wait for that one!! LOL! Sarah, I have to say your excitement for winning had me rooting for you! Good luck!!! Oh, WOW, SARAH ... you sure know how to leave a comment, girl!! :) Thank you SO much for your incredibly kind words about APMP and just for reading my books in the first place -- that blesses me!! And if you win, I can send you either the ALITW ebook OR a signed spiral-bound ms. that I had printed for contests. I still have a few left, so GOOD LUCK in the contest, you sweet thing!! Julie, words of wisdom--that's for sure! Having lived quite a long life, I sometimes find myself frowning and shaking my head, when watching some of the more modern programs on TV, where the writer was clueless about the 50's, 60's, and more recent historical speech or behavior. For example, no one in those years would say "we are pregnant". Back in those days only one person of the couple was pregnant, not both! It does give me a chuckle, though. Love your examples and recommended sites. I do think it is important to keep details true to the setting. I believe it gives the author more credibility. Hey, KAY, I SO agree, my friend, which just underscores the importance of getting one's facts straight. Hi Julie - I would love to win one of your books - thanks so much! Good Luck Sharon! Throwing your name in the hat! Gosh, SHARON, so would I -- love for you to win one of my books, that is, so here's to pulling your name from the hat, girlfriend -- GOOD LUCK!! Oh my goodness, I so needed to read this. I will be bookmarking all those sites post haste! LOL But I also have the added arm of research - if certain things were said/done/used/worn etc in colonial NZ at that particular time - just because it was said/done/used/worn etc elsewhere int he world, doesn't mean it was in common use in the colonies down under. But thank you for those links, it's a great place to start! And yes, would LOVE to win one of your books - I'm only missing one at the moment, LOVE AT ANY COST. Best of luck in the drawing, Ellie! And thanks for coming by! Hi Julie - Saw that you'd be here after going to Seekerville first and so glad I did. I appreciate all the research that goes into writing an historical novel and realize too that writing an historical romance is even more of a daunting task. My hat's off to you. Enjoyed those favorite scenes from your stories. Many thanks for the links. I've bookmarked them for future use.. I remember those typewriters with a hard return lever on the side as my mother had one decades ago. Hey Pat thanks so much for coming by. So glad you found your way to 'The Society' from Seekerville! I'm bookmarking those same links! LOL! I'm sure Julie won't mind you being addicted to her books! It's a great addiction to have. Good luck! GOOD LUCK, sweetie, and just FYI ... let me know if you like it and post a review because I'll be having a newsletter contest soon where one short review can win you a character named after you in my next book, and a signed copy of that book, okay? Plus the top poster wins a $50 gift card as well. So, here's the link to sign up if you're interested, but if not, NO WORRIES!! HAPPY READING and GOOD LUCK!! Ok so first off sorry for commenting so late! Church, nap, and family time kept me busy! Second I was reading your reply Julie to Sally and I love those scenes!!!! You know how recently I read these books and yet you are making me want to reread them!! And now for an actual comment on the post! I had never given to much thought to the little historical details like that (mainly because I'm not a writer) but they really do make a difference! A couple other writer's blogs I follow have mentioned this in the past and it made me a lot more aware when reading! I'd probably be guilty of using the wrong words if I tried writing but I think the research would be fun! How much fun stuff would you learn?! Hugs and GOOD LUCK, Abs! I'll be back tomorrow to respond to the rest of the comments, so sleep well, all!! Hey, MAXIE ... good to see you here, girlfriend, and SO glad you finally have the WOC series!! Now we have to start working on the Heart of San Francisco series, eh?? Here's to a win, my friend!! Great interview! I could see the fun and the dred of the research. However, I learn a great deal from all the authors research, than you. Thanks, JACKIE ... glad you made it by to enter. And I learn a lot from research too, so that's the benefit of reading historical fiction, right? Very interesting to read of the background legwork that must be done to weave a most believable tale! You have a good support system to help you through the process and force your mind to go over each detail thoroughly. Thank you for sharing your websites, too. I'm sure they'll be a help to aspiring authors. pudy68 @ gmail dot com. My pleasure, J SMITH ... and thank YOU for coming by to leave a comment. Here's hoping it will net you a win! That is so cute Jules... I am 49 and I can even remember a lever typewriter ! lol Love the links for ideas and history though, so awesome to find such good information. OH and I am still aiming to win your last novel ! Sigh... I can always hope....right.... It is the only book that I don't have.... well other then your romance book !!!! I am so praying and I actually did pray about this and ask the Lord to bless me in some small way thru this Seekerville Scavenger Hunt.... I love my kindle but the kids are wanting to use it for books games ect too and having another device would be a blessing in our house anyways... Homeschooling would be easier too. Thanks Julie, I so love to hear the praise you have given to me, but it is truely the Lord who is the one to recieve the credit... I am who he has made me and who he is making me to be. I loved this post! What a lot to keep up with for all those historical romances! It truly does make a difference in the feel of the books, though. I know that I sure felt immersed in the WWI era during A Passion Most Pure. Looking forward to reading more of your books! Really enjoy your books, Julie. Thanks. I wouldn't like the historical research either, but I sure do enjoy reading historical fiction when others have done the research. Thanks for your sweet comment and GOOD LUCK in the contest! Honestly, I might notice those quirky details whilst I read, but I'm not generally a reader who 'calls out a writer' for it! In fact, I received an author NL recently where she had to 'apologise' for using the word 'right' in lieu of 'write' and I send her a note in response that said I think readers need to lighten up! I mean, seriously!? Yes, we all have different tolerance levels, but I feel that a measure of human error is expected in all things, writing included! Now, if its blatantly obvious and disrupts the timescape or flow of story by jettisoning me out of sequence - yes, that is a pet peeve, but generally speaking, I'm a low-key reader who nestles into stories without a critical eye! I have a curious question, do you find research to be a drudge nowadays OR a happy adventure!? I was curious if you found a shift in the task between "A Passion Most Pure" and the latest trilogy!? Is there an era and locale that you are itching to explore next that you haven't yet revealed!? Where does your heart lead you too the most!? Thanks for offering such a wicked sweet bookaway! I know which title I'll pick if my name is drawn! JORIE!!! Sooooo good to see you here, my friend -- I know you have been CRAZY busy with your new blog, so I am BLESSED that you happened upon this one today!! Thanks so much for this great giveaway and the interesting list of links. I'm going to check them out! Historical accuracy really make reading a more enjoyable experience and I'm glad you are so careful about it. I sometimes have found myself thinking "I don't think she really would have said that" or "I don't think they had those things back then". It's a much better experience to be able to transport yourself back in time with a degree of authenticity. That's half the fun of reading historical novels!! By the way -- LOVE your addy: Mary / Touch of Heaven!! Great post! I honestly didn't know that about chocolate chips... gotta love the things you learn each day! =) Julie, I LOVE how accurate you make your books- not everyone would've taken the time to research the little things that you did- I think that's awesome! Hugs, and I hope all is well with you! Oh, and your grandson is adorable! Congrats to you and your husband! ELYSSA!!! Hey, girl, SO fun to see you here, my friend, and yeah, that's a hoot about the chocolate chips, isn't it? I'm crazy busy, but good and YES, my new little grandson is A-DORABLE!!! I get to see him soon, and I cannot wait!! Oh, and his 2-year-old sister??? Love that little peanut to pieces!! Here's to a win, Lyssa!! I hate history... well, the kind you have to STUDY in school. I LOVE Historical Fiction-- I love that authors do their research and teach me historical facts (I hope they are using REAL facts in their books!) and that I can LEARN about history through the lives of people (yes, I am more interested in how a certain situation/war/etc made someone feel or affected their day-to-day lives, rather than the date, time and place of what happened). Thank you Julie (and so many other wonderful authors) for doing the research for your novels and sharing your knowledge and craft with us!! :) It makes my world much more enjoyable -- the fact that I get to read such entertaining, educational and beautiful books as yours!! Hi Julie! Hi Debbie! I hope I'm not too late to join in on all the fun! I had to have an emergency surgery the 5th and getting over "anesthesia brain" and being able to see without closing one eye has been a longer process than I thought it would take! I don't read Christian historical fiction, or any Christian fiction normally. Well, I didn't until I read A Light in the Window, but this last year the Lord has been convicting me about a LOT of stuff in my life. You know: garbage in, garbage out-and all that? So after I read 'Light' in mid January I made a late New Years Resolution to read only Christian fiction for a full year, and I may never go back! I love an author who makes me want to jump through the pages and wring the rogue's neck (Sam O'Rourke) who can't seem to stay faithful to the naive heroine (Marceline Murphy) or makes me want to shake said beautiful young lady by the shoulders and tell her to "Wake Up!" You did that for me, thank you! I have a question for you: Is the old Irish tale about leaving a light in the window a true tale or was it only because of the story line in your book? Like most everyone, it seems, I'd like to write a bestseller, but I haven't quite felt the Lord lead me in that direction yet! But I do think about all the research historical fiction would take and my biggest hang-ups are the language and the way they speak, and then the clothing. I have the hardest time picturing women's fashions-the dresses, the separate articles or pieces of clothing and the way they all fit together. I've learned a lot when I can press the word on my kindle and it gives me the definition, but I still have trouble picturing the entire outfits. I started Harvest of Gold by Tessa Afshar right before my surgery, but I do believe I'll kind of have to start over and speed read to remember everything that happened in the first 25% that I made it through. As soon as I'm done reading Harvest the next book on my list is A Passion Most Pure. I'm really excited to get to know the O'Connor family! Thank you for sharing your love for the Lord and this amazing gift you have with me-and the rest of the world! KRISTEN, YAY!!!!! I am SO blessed to hear that A Light in the Window had a hand in your commitment to Christian fiction -- THANK YOU for telling me that! And I am reallllly excited to hear A Passion Most Pure is next on your list. I hope you enjoy Marcy & Patrick's story 20 years later because even though they're older, the passion between them is JUST as strong! AND ... I do hope you took advantage of the FREE DOWNLOAD right now going on for APMP, I hope??? Happy reading, my friend, and GOOD LUCK!! You have another book w/ Marcy and Patrick? Is it new or is it a WIP? Or are they in APMP?!?! Thank you so much for the chance to win one of your books and chat w/ you! Oh, and I JUST realized I never answered your question about whether or not the putting a light in the window is a true tale or one I made up!! Well, guess what -- here's research at its best -- it is TRUE!! It's an old Irish tradition at Christmas to put the candle in the window from Christmas Eve till Jan. 6th symbolizing welcoming the Christ Child and Mary and Joseph into one's home. When I found that out, it became the perfect central theme for the story, when two rogues fall in love with Marcy, but only one responds to the "light in the window," or the love of Christ in her heart. :) Isn't that cool?? Let me know, okay?? Oh, and just FYI -- I have a newsletter contest coming up next month where reviews posted can win you a character named after you in my next book, a signed copy of that book, and a $50 gift card, okay? Here's the link to sign up if you're interested. http://www.julielessman.com/sign-up-for-newsletter/. HAPPY READING!! That is so cool to know I'll get to see them grown up and the influence their love had on their children! Now I feel kinda ditzy not catching that about their family name! That Irish tale is a truly beautiful tale, thanks for sharing it w/ us. Love the post. Sounds like you spend as much time on research as you do writing the book. Congrats to you and Seekerville. Great accomplishment. Keep writing. Would love to win a book and thank you for the opportunity. I would love you to win a book, too, sweetie, so GOOD LUCK!! TERESA!!!! One of my VERY FAVORITE reviewers in the whole wide world -- LOVE seeing you here, my friend!! LOL ... not to rush me, eh??? Well, if you can hold on for TWO MORE MONTHS, you'll have Alli's story in your hot, little hands, and if I must say so myself, it's a hoot!! Thanks Julie for another fun and informative article! My own research is often overwhelming, but I know it's key to the story and the key to readers' hearts as well. Thanks for sharing the links. I've LOVED every one of your books I've read so far, but my "To Read" list isn't complete just yet. Thanks for adding me to the fun giveaway. Hey, SAVANNA, well then we are just going to have to lower the count on your TBR, aren't we?? If you haven't read A Passion Most Pure yet, it's available for FREE DOWNLOAD, okay? What can I say there are very few writers like Julie Lessman she truly know how to keep you captivated BUT more importantly share just a beautiful message of God's love and how it can change people lives!! Bravo Julie Lessman and may I say I know I am just one of many of your life long fans!! Aw, LIZA, that is SUCH a sweet thing to say, my friend -- THANK YOU!! And I am blessed to have a "life long" reader friend (I prefer the word "reader friend" to fan as we are all just women friends who love God and romance, right??) like you!! Oh, AMY, I am soooooooo excited you downloaded APMP -- YAY!!! I hope you enjoy it and if you do, you might be interested in a newsletter contest I have coming up next month where reviews posted can win you a character named after you in my next book, a signed copy of that book, and a $50 gift card, okay? Here's the link to sign up if you're interested. http://www.julielessman.com/sign-up-for-newsletter/. HAPPY READING!! Thanks for such an interesting article. I appreciate authors who can transport me to another era and your books qualify, Julie. I would love to win a copy of one of your books. Thanks, RENEE, and I would "love" to send you a signed copy of one of my books, so here's to a win, girl!! You are one of the best at writing great romance, imo, Julie! I'd love to win a copy of one of your books! Thank you for the opportunity! Aw, THANK YOU, KAREN -- MUCH appreciated, my friend!! And I would "love" for you to win one of my books, too, so here's hoping Mr. Randomizer draws your name!! Nice review! I would love to win one of your books. Yes, I guess a lot of research goes into writing so that little time frame errors don't pop up! I am a genealogist and totally understand that concept! Thanks, SONJA!! And if you haven't read any of my books before, then you are in luck!! My debut book, A Passion Most Pure -- American Christian Fiction Writers Debut Book of the Year in 2009 is available for FREE DOWNLOAD right now, so I hope you take advantage. And guess what? You do NOT need an e-reader to download it!! You can download a free app for your PC, Mac, iPhone, iPad or Droid that will open you up to a whole world of FREE Christian fiction!! The link for the free download is listed above beneath my article and above my bio. Then for your free Kindle app, here's the link to check that out -- just copy and paste into your browser and you're good to go. Hey, girlfriend -- SOOO great to see you here, and you are SOOO due, Wanda, so I'm hoping we pull your name out of the hat, my friend. QUICK QUESTION: I thought you had read one of my books -- no? If not, OH MY GOODNESS ... we desperately need to get one in your hands, and I am SOOO glad you downloaded APMP, because that is the PERFECT place to start!! I absolutely love historical fiction, so was glad to see the link to this on Marylu Tyndall's facebook page. Always nice to be introduced to a new author. Sweet! In fact, I always like to suggest to those who have never read me before that they check out the EXCERPTS page of my website where I have listed my favorite romantic and spiritual scene from each of my books so you can get a glimpse at my "passion with a purpose" writing. Here's the link if you're interested, okay, and GOOD LUCK!! Thanks for sharing such an interesting post! I can tell how much hard work and research you put into your novels and that makes them all the better. It's easy to get lost in the setting and really see the scenes unfold. Your books are some of my favs and I always love hearing more about them! Hey, LIZ, hello!! Always good to see your name pop up, my friend, and THANK YOU for your kind words and support. Would love to pull your name out of the hat, so GOOD LUCK!! HI, I am so glad you stopped by the website. Wow Julie! I would of never guessed that all that thought and research for even the littlest things must go into a book! It sure gives a person a lot to think about when they write a book. My older sister, as I may have told you before (I can't remember), wants to be an author and has entered/will enter some writing competitions. I will definitely show her these websites! I'm pretty sure they will/could be a big help to her! Don't stress about any of the critique pages that publishers give you because once you have everything figured out your books always turn out to be GOLD! BTW, ALITW was amazing if I have not told you yet, and I can't wait to read your The Heart of San Francisco series! If I win I would love to receive Love at Any Cost! Thanks for the giveaway! SALYNA!!! You definitely should tell your sister to check out our group blog Seekerville if she's looking to become an author because we were listed on Writer's Digest list of the "101 Best Websites for Writers." And thank you SO much for your sweet comment about my writing and ALITW!! I sure hope you consider posting a review on Amazon for me if you have time -- short and sweet!! ;) Then be sure and let me know and I will give you a point in my upcoming newsletter contest, okay? We DEFINITELY need to get Love at Any Cost in your hot, little hands, girl, so GOOD LUCK!! Thanks SO much, Wilma, for your sweet comment -- MOST appreciated!! And I look forward to you reading my "future creations," so here's to a win!! Congratulations Sonja! You won Julie's book! !